If you have a middle schooler then you probably have heard of the game Minecraft. My son discovered it this year and loves playing it. I haven’t really looked at it myself, but I know my husband reviewed it to make sure we were OK with him playing it.My son picked out his new backpack for school and when my daughter saw it she said it reminded her of Minecraft. 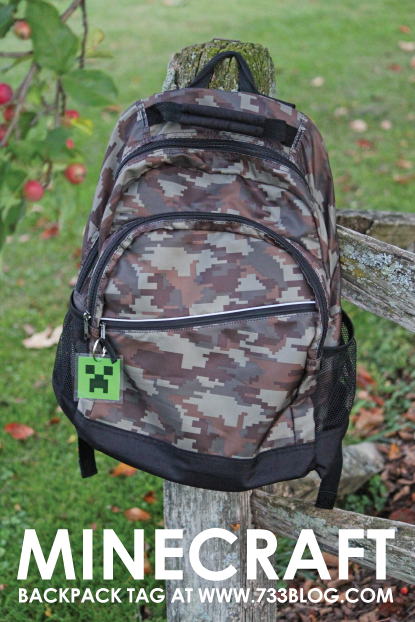 I agreed and thought it would be fun to make a zipper pull that could double as an Minecraft Backpack Tag. Even though I don’t know much about the game, I do know that there are these bad guys known as “creepers” that sneak up on the main character and explode. I created one on the computer, sized him to 2″x2″ and printed him out on cardstock. I cut him out and flipped him over where I wrote my sons name and his homeroom code. 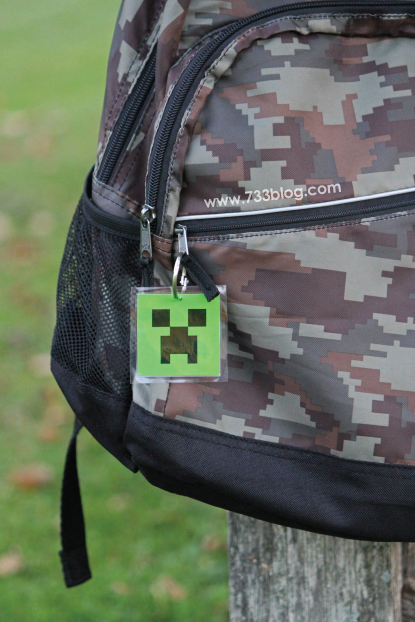 Download the Minecraft Backpack Tag in pdf format. Next I inserted it into a laminate sleeve and ran it through my laminator and trimmed it down. If you don’t have a laminator you could always use clear packing tape to seal it on both sides! TIP: when laminating the tag leave a bit of space at the top so you can punch a hole through just laminate, not the paper as well – this protects it from water seeping inside and getting on the paper. I also finally located my ball chains (which were missing when I took these pictures), and replaced the ring with on of those for a more secure attachment. Super simple and very trendy for an elementary/middle school child! My sin and daughter will both love these! Thanks for the printable! Thank You for doing this! My son will love it!